Yesterday we had a late start due to our breakfast regimen: being the supermarket. Which consisted of budget cornflakes mixed with the “free” grapes and bananas, in a vague attempt at muesli. Total 2 Euros. We then battled against a wind headwind up the Dordogne River and found yet more grapes, and this time, apples, waiting to be eaten. We then had a roadside lunch in Bergerac. We continued down the river, and got partially lost, resulting in an unnecessary climb and the consumption of more of the muesli. We ended up in a beautiful village called Cadouin. Hi, on Saturday morning we awoke early in order to take out money from a neighbouring town, a 10k trip. After another good breakfast we set off towards Domme. We stopped for lunch in supposedly one of France’s most beautiful villages. We ate the previous day’s muesli in a baguette, the truthfulness of the claim was discussed and rejected. We had an impatient yet expensive tour of the castle, after which we decided where to sleep........4 hours and 80km later we arrived tired but in style, having successfully flashed by a speed camera. We rested two days in Cahors. Domme was a bit touristy but had a fantastic view. 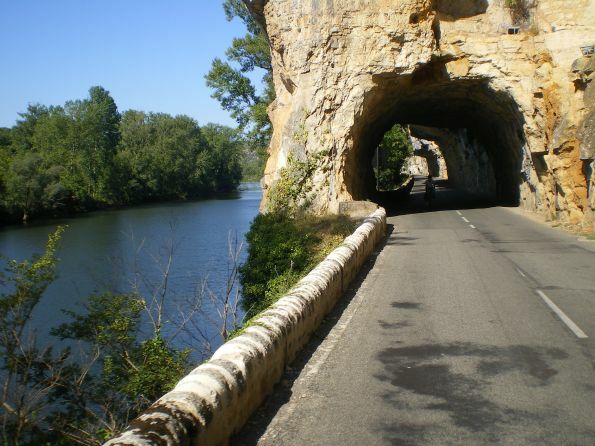 The Dordogne was also a really great landscape, with a lot of picturesque little roads winding around vineyards and farms. We only briefly cycled around the old town, but I think Cadouin has been the most beautiful so far. We awoke early feeling rested, after spending two days in Cahors seeing its limited sights. We tried our luck at the buffet breakfast, which we declined to pay the previous night, and failed. Promptly leaving the Hostel we set off and were confronted with a giant, seemingly endless climb. This confirmed my fears that I had indeed busted my knee on the long days ride coming into Cahors... no more clipped in pedals for me. The rewards for such a long an arduous climb were a few seconds of exhilarating speed hampered only by the hills tight bends, the realistic possibility of an oncoming car, and an injury far worse than that of my knee. We continued down the Lot, which we both agree was magnificently beautiful. Due to my knee I was forced to slipstream Hugh for much of the ride, which he put up with very well. Travelling up the Cele tributary to the Lot, we discovered that apparently the French see Monday lunch time, and the whole of Sunday for that matter, as an excuse to shut up business. This made fuelling us a problem as we were in the middle of nowhere. Fortunately after sitting outside the bakery we managed to receive a free baguette from a local, who must have took pity on our malnourished and sorry-for-ourselves appearance. We arrived in Figeac and found an exceptionally helpful tourist info chap, who despite this, failed in finding us accommodation in Toulouse even after recruiting his neighbour. 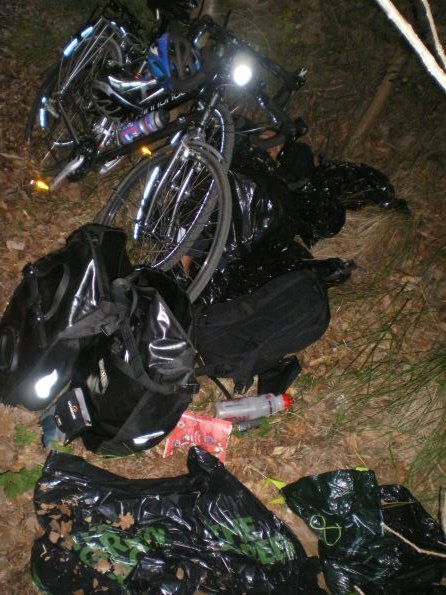 We took a train to Toulouse, and after spending an hour in some questionable areas, trying to find accommodation, we realised that the best option was to by buy some bin bags and have a night of rough camping by the side of the Canal du Midi. This plan backfired at around 4 in the morning when the near sub zero temperatures overcame our bodies raised metabolisms, bin bag insulations and threatened hypothermia. 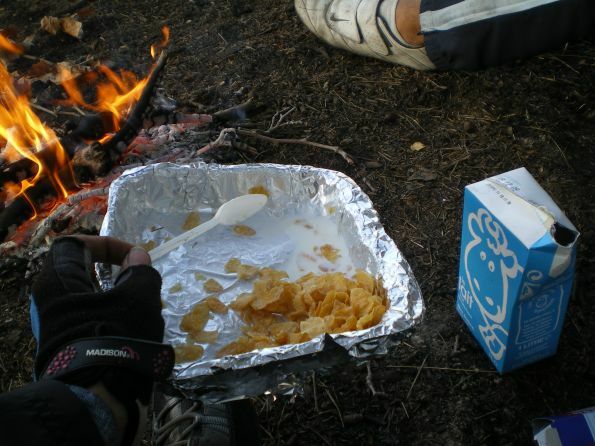 We survived the night...just, and spent half the morning searching for a suitable place to build a fire for our budget tinned ravioli. Whilst travelling down the Canal, we realised just how cost efficient rough camping really is, and decided that this would be the way forward given our previous expenses. The next two days we cycled down the Canal. We stayed one night in a Hostel in Carcassonne, which was situated in a actually very impressive castle. We also met a medical student who confirmed my knee injury as overstrain, and confirmed that there could be no quick fix. The canal may well have had good views, but due to the poor-very poor condition of the path, we spent the entire time avoiding a bone ratteling. I am pleased to report however that our bikes withstood this battering with remarkable ease, our wrists on the other hand faired not so well. I shall also report that my Brooks leather saddle is, despite appearances, a very comfy saddle indeed, apparently more so that Hugh’s, modern style saddle anyway. 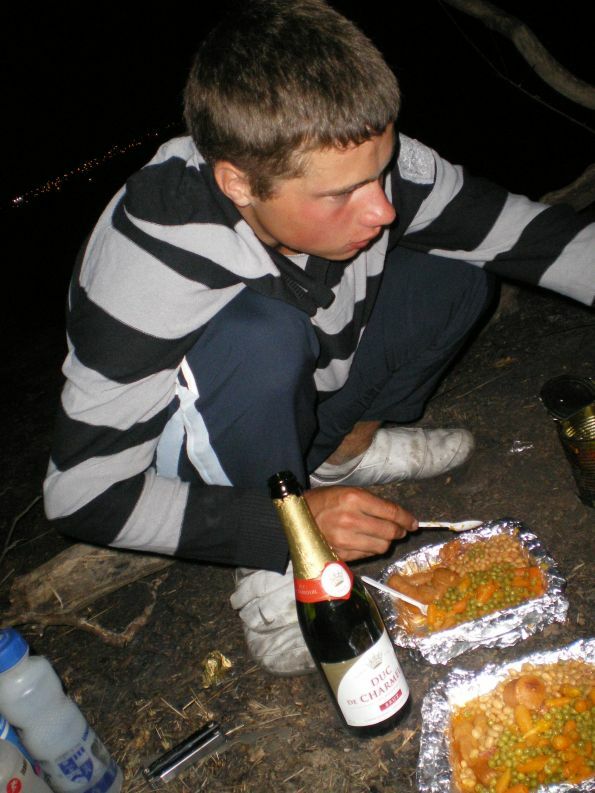 That night after stoking up on supplies at a hypermarket, we set off in search of a suitable rough camping area. 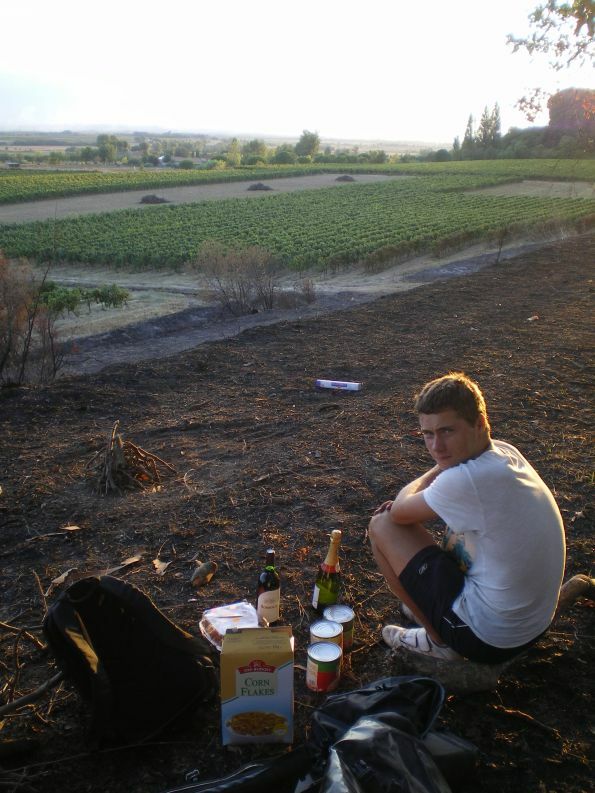 We managed to find a superb location, and set about cooking our budget-but-filling dinner on a fire. Having learnt our lesson from the previous attempt at roughing it, we secured a large roll of extra large bin bags, and donned all our clothing which we hadn’t sent home. However despite our extensive precautions, and two bottles of wine (totalling 3 Euros), we awoke yet again freezing. More bin bags were applied, but it was all in vein. As soon as the sun rose we quickly assembled a fire and had breakfast. Another rough days cycling down the Canal and we came to Agde. You should know that we no longer like Agde. We had a bad lunch, and after having no punctures so far we sustained two simultaneously, but of different causes. An hour and two inner tubes later we were on our way towards the sea. We promptly got lost. Leaving Agde, and the Canal; behind we arrived at last at the Med. We had a stress relieving swim in the unexpectantly chilly sea. Coming out cleaned and in a good mood we found a Hostel in the nearby city of Sete. The following morning we awoke to evidence of the first signs of the autumn rain….not good news. We once again made the most of our paid for breakfast and set off. Speeding down a steep hill with the slimy wet tarmac, Hugh's back tire locked up, and sent him sliding on his side down the road. The inevitable road rash was sustained in the form of another knee injury. At this point we had practically finished our planed route, and seeing the weather forecast for the next few days as rainy, we decided that it was best to cycle to Montpellier and start the train journey home. 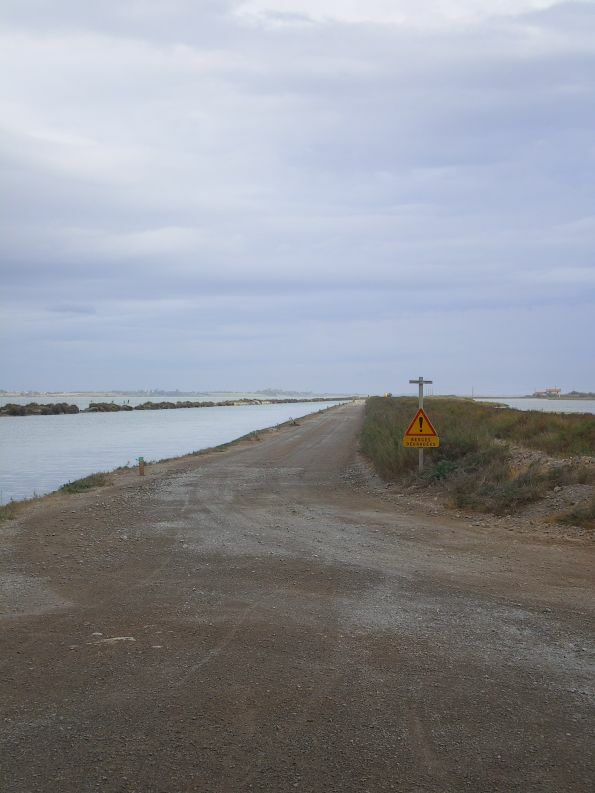 The cycle to Montpellier was along a lonely canal in the middle of a storm threatened sea, it was perhaps the bleakest ride of our trip. I had Neil Young’s ‘Everybody Knows This Is Nowhere’ on repeat in my head. On top of this we discovered that the train journey home was actually going to consist of multiple train journeys, involving amongst other things, an overnight train and the almost complete dismantling and reassembling of our bikes. Needless to say over the next 38 hours or so we had a comprehensive experience of French rail travel...not an enjoyable one. Anyway as we right this, we are sitting safely at home, with a full roast dinner in our stomachs, and a rather excellent mini tour/adventure of France behind us. 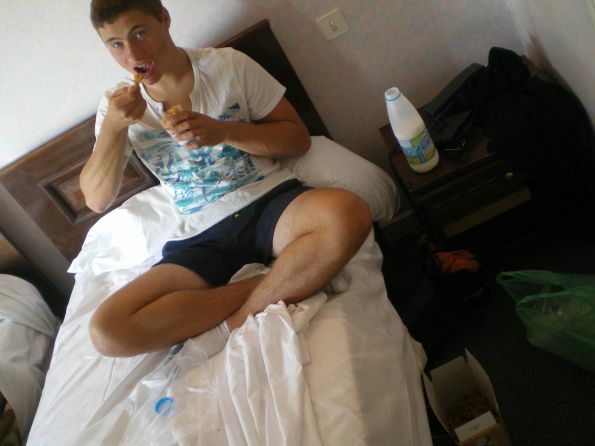 We have learnt a good deal about the practicalities of Cyclotouring, rough camping, living cheap, and of France itself. 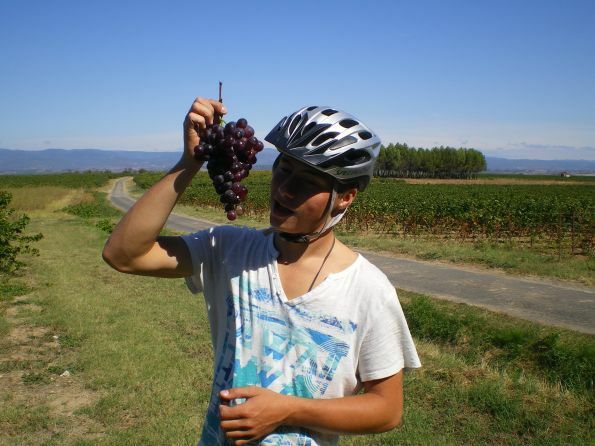 In conclusion then, Cycling around France is perhaps the best means of gaining an up-close view of the country, and I cannot wait to see what New Zealand has to offer for the humble Cyclist. Finally I would like to thank Briand and Stuart, for their uncompromising over generosity in helping organise and prepare for our Trip. Without whom we would not have had such a great adventure. I guess these are the perks of being a member of a club of such a standard as Twickenham CC. Regrets: Not bringing a tent and a sleeping bag. 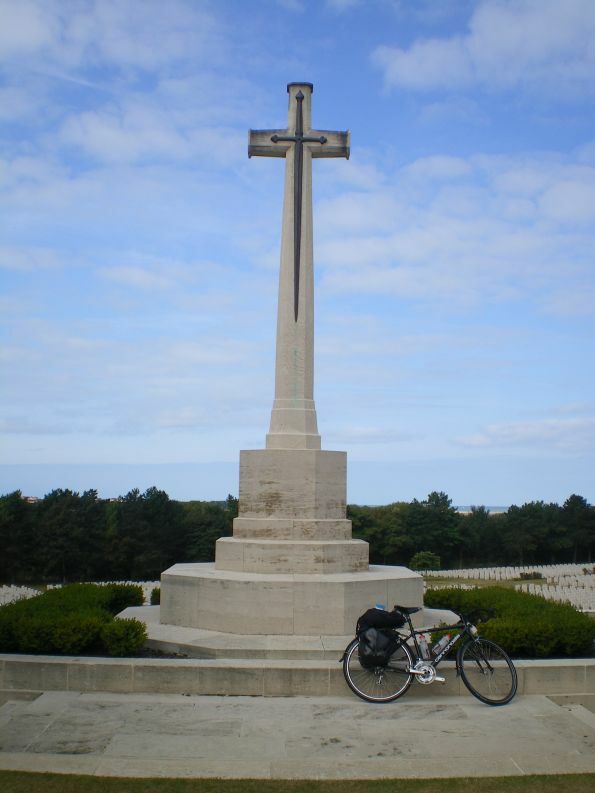 A commonwealth cemetery near Etaples. 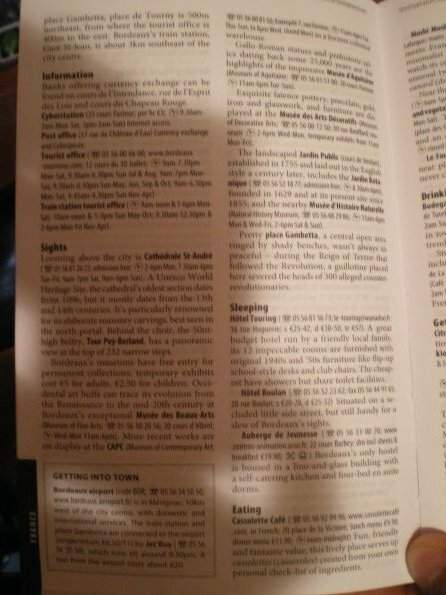 We took pictures of relevant extracts from Guidebooks on the ferry and in Hostels, in order to save us buying them. 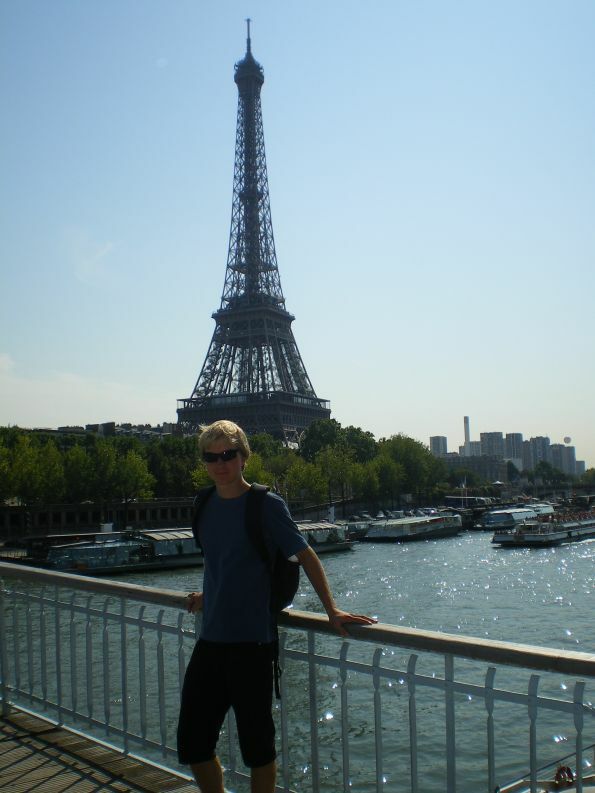 Me doing the classic Paris Tourist snap shot. Looking notably Australian. 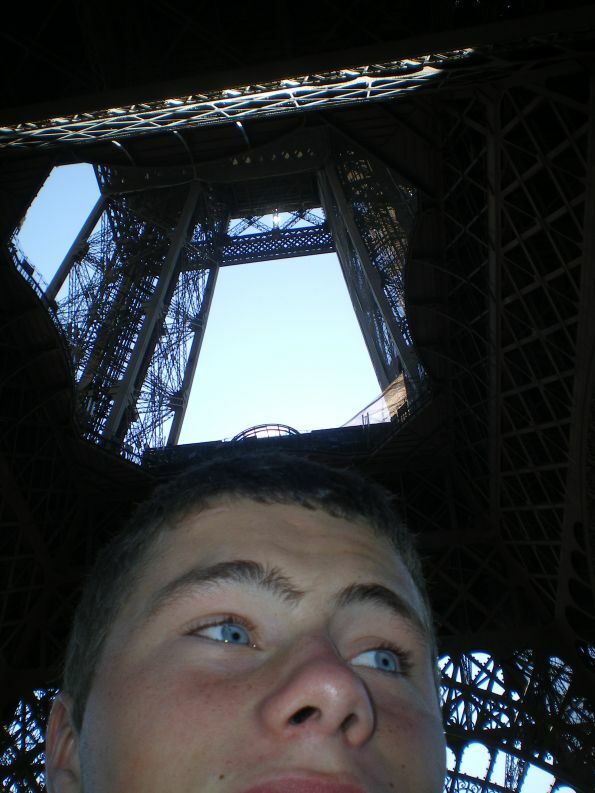 Hugh in a not so classic Paris Tourist style snap shot. One of our budget lunches being eaten on the Dordogne. This one cost 80 cent. Hugh eating our Home made budget musli. 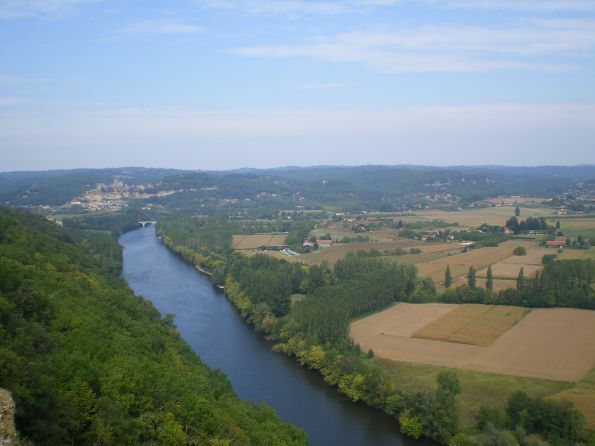 One of the many spectacular view points along the Dordogne, this one from Domme. The overhanging Cliffs along the spectacular Lot. Our bin bag beds on a rough camping night. Us harvesting some of the ample grapes. These ones were big. One of our rough camping nights. 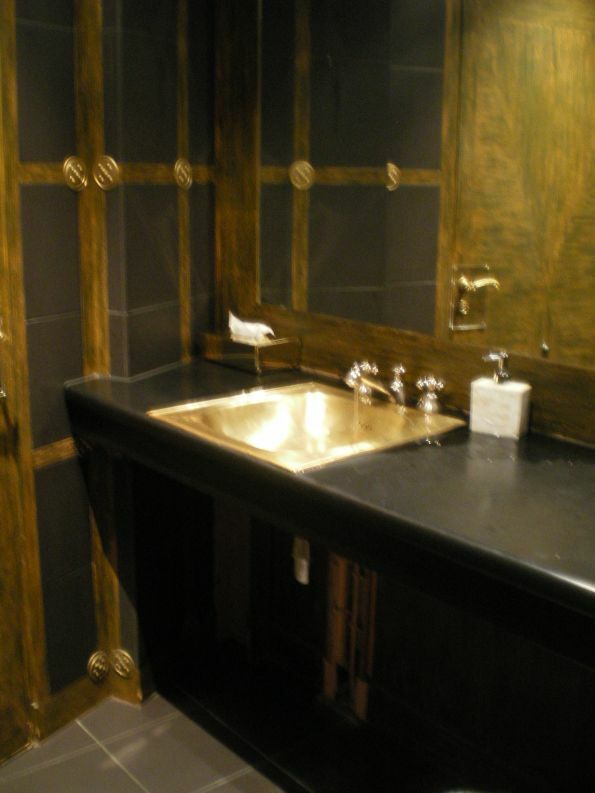 (note the Champagne bottle though). Breakfast, Quite a contrast from the two star Michelin starred restaurant which we ate at in Paris(it’s Toilette). 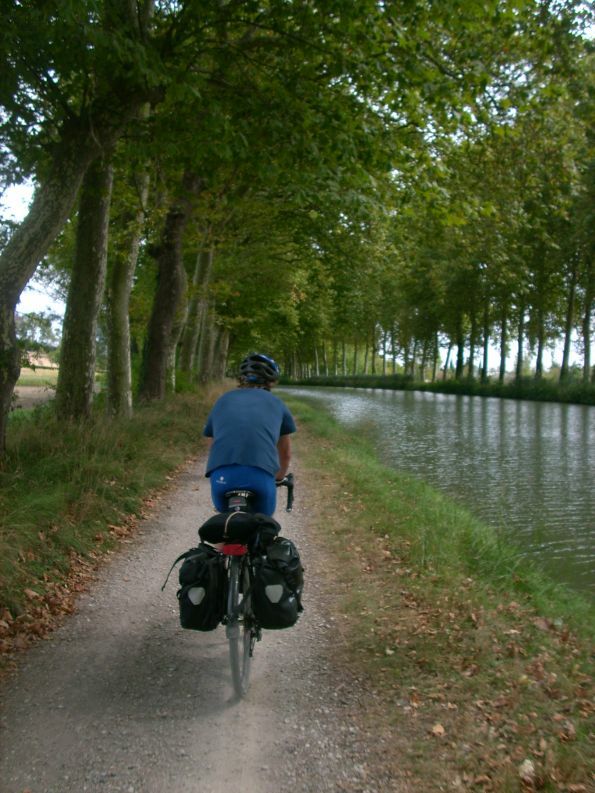 Canal du Midi, on a section of good track. The Bleak Canal towards Montpellier. About an hour was spent along this. 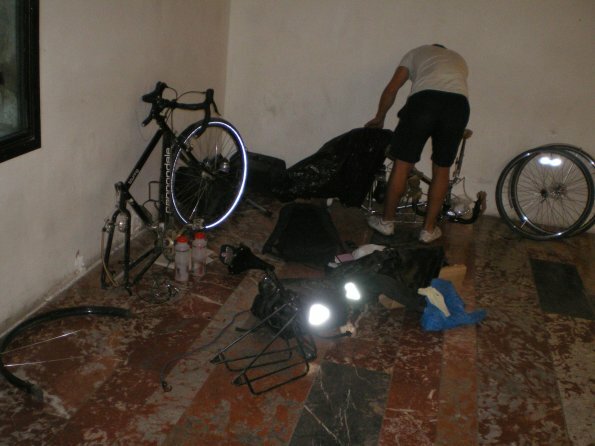 In the process of dismantling our bikes in the train station. A lot of effort, after which we decided the end product of took up more space than the bikes in their normal form.